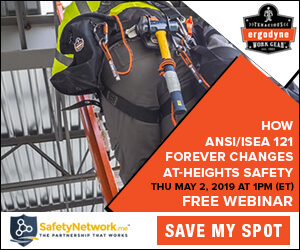 Takeaway: Achieving true workplace safety requires a broader scope and greater collaboration between management and on-the-ground workers. Ever go to work and wonder why things keep breaking down, or why things don’t go right? Why does work have to be so hard sometimes? To better understand how work is done, you have to look at your job and understand how you perform it. Are you safe? Do you cut corners or follow procedure? Understanding the duties or your job and the expectations that are required are some of the most important things to keeping companies - and employees - in business. That's part of the logic behind behavior-based safety (BBS) initiatives. This refers to the application of behavioral research to safety practices and it's based on research conducted by Herbert William Heinrich in the 1930s. But while it's not an entirely uncommon approach to safety initiatives today, critics say that by encouraging supervisors and co-workers to report on whether other employees are working safely (and rewarding and disciplining employees accordingly), BBS shifts too much blame for worker accidents onto workers' themselves. According to an article by Scott Schneider that appeared on the Laborer's Health and Safety Fund of North America website in January 2013, a more careful examination of Heinrich's research shows that he actually asserted that management plays a key role in safety as well. So, rather than blaming one side or the other, it might be best to use some of the key components of BBS to focus on creating a safety culture where both management and workers play a role. Here we'll have a look at the role workers play in ensuring their own safety and the safety of others in the workplace. One of the first steps to staying safe on the job is for workers to understand the key hazards they face. What are some of the behaviors or duties required as part of your job? Are they physically demanding? What are the issues that offer possible risks? It does not matter what industry you are in; using a safety-based approach to tackling your daily job can help you stay safer - and even provide better insight into your duties and performance. To get started, take a pen and paper and write down what your job is, and some of the core duties associated with it. Are any of the specific duties in themselves hazardous? Possible hazards can be physical, mental, or a combination of both. A creative way to identify solutions for these tasks is to break down the specific items or components that you are not happy with from a safety perspective. Ensuring that the safety culture extends beyond full-time workers to contractors and any one else who enters the workspace. 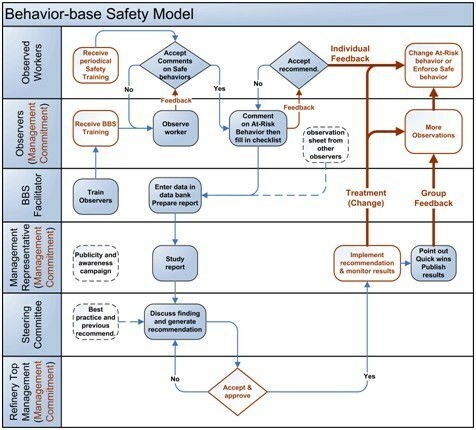 If you take a look at the behavior-based safety model below, you'll find that while workers receive training and their behavior is assessed, they are not considered an important input when it comes to making changes. By the same token, management is not asked to consider its role in workplace safety. Those are two drawbacks to behavior-based safety that many critics decry. A safety culture, on the other hand, aims to bring the two groups together in pursuit of a common goal: A safer workplace. That said, it's still important for workers to take some initiative into their own safety. Since there are many levels of safety to consider no matter what your industry or employment type, and no matter what level of the organization you are in (management to worker), it is important to do a causal analysis so you can identify factors that not only impact your job, but also the organization as a whole. As illustrated by the diagram, it is important for workers to document areas of concern that may be hazardous, and report them to the person responsible for safety in your company. This can impact your job because it may change the way you perform your tasks, as well as provide input to how the organization functions as a cohesive unit. One benefit to BBS is observation. Sometimes workers become so used to their environment and its hazards that they fail to notice the risks they face. This is why it's so important to include both worker and management perspectives to build a truly safe workplace. Behavior-based safety proposes that workers' behavior is the key piece of the safety puzzle. In fact, achieving true workplace safety requires a broader scope and greater collaboration between management and on-the-ground workers. Do workers need to take responsibility for their behavior at work? Absolutely. But it's also up to employers to ensure that workers have the tools, resources and education to safeguard their own safety - and help their employers improve overall safety in the workplace.